NGC 6791 – Open Cluster In Lyra- Beautiful If You Can See It! 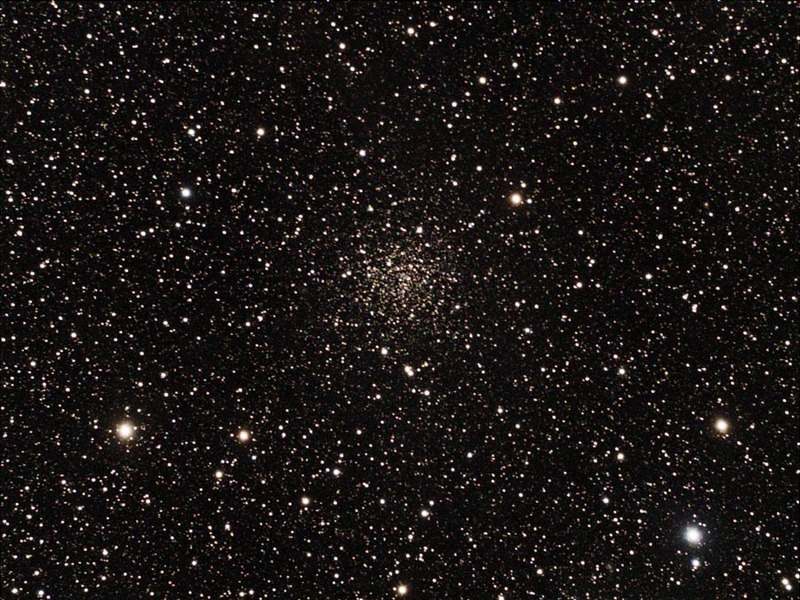 NGC 6791 is a faint and difficult open cluster from my moderately light polluted backyard. However, for me it was very difficult, but once found….it was beautiful! 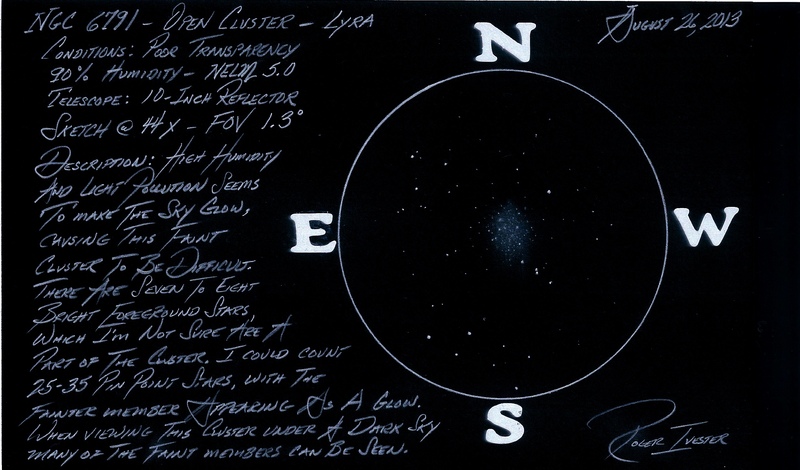 The cluster appeared as a very faint glow with a somewhat elongated shape, oriented N-S. I could count about eight fairly bright foreground stars, but in the darkness behind these stars was a sprinkling of maybe 35 very faint stars. Averted vision was required, and the faint stars of the cluster seemed to sparkle. What a beautiful sight! The fainter stars seemed to be far in the distance behind what I perceived as foreground stars. The most noticeable feature is a chain of three brighter stars on the SW edge of the cluster. The middle star in the chain has a fainter companion, which makes a total of four stars, but this additional star required at least 100x to see. I can now easily locate this cluster by looking for this small star chain. The following sketch was made using a blank 5 x 8 note card, and a No. 2 pencil. The colors were inverted using my scanner. This entry was posted on September 21, 2013 at 12:53 am and is filed under Work File Only - Observer's Challenge Reports. You can subscribe via RSS 2.0 feed to this post's comments. Both comments and pings are currently closed.